Here are two recordings by the Victor Military Band from 1916. Walter B. Rogers was the conductor on both of these. 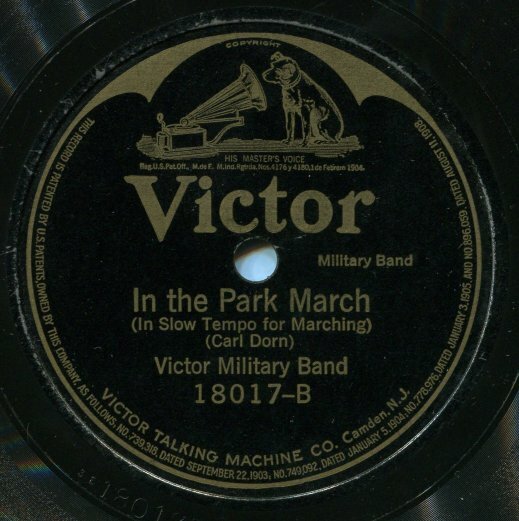 “In The Park March” was composed by Carl Dorn and originally published by the Boston based Oliver Ditson Company in 1903. Because I think the song is very catchy, I became curious to know more about Dorn. Google searches for that name turned up only limited information. I was able to find reference to a few other songs he composed in the 1870s – all of them published in Boston. Sheet music of one of his 1878 compositions “Trũme der Jugend Waltzes” on the Library of Congress website includes a dedication “to my brother William Dorn.” This proved to be the key to my solving my little mystery as to who Carl Dorn was. A search on Ancestry.com found a William Dorn who was a Boston area violinist during the 1870s and 1880s. Census records indicate that he had a brother, Charles J Dorn (1838 – 1909) who was listed as a piano tuner in federal Census records and in Boston City Directories from the 1870s through the early 1900s. Charles Dorn had two children – Frederick Hugo Dorn and Elizabeth Dorn – who, according to the Catalog of Copyright Entries renewed the rights to one of his arrangements of “In The Park March” in 1948. Mr. Dorn died November 30, 1909 on a passenger train just before it pulled into the train station in Orange, Massachusetts. Charles J Dorn was well-known in the Boston area as a guitar player and as a composer of guitar music. It appears that he might have published under the name “Charles J. Dorn” on the compositions and arrangements that he wrote for guitar and under the name “Carl Dorn” for his other compositions. Interesting World War One era recording.